Saree is one of the most gorgeous and elegant among the traditional Indian attires. Gone are the days, when sarees were meant only for ladies. 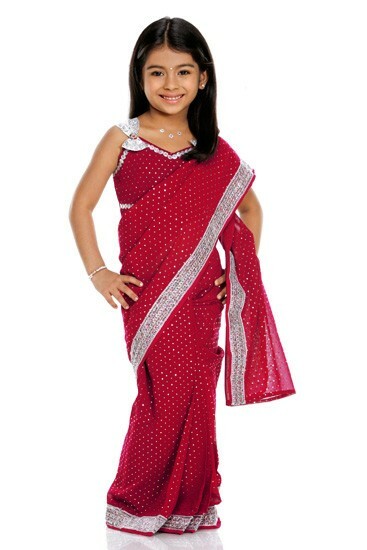 Nowadays, ready-to-wear sarees for kids are becoming very popular. 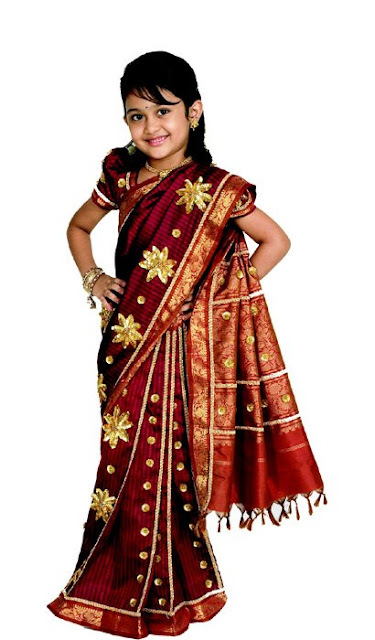 Parents who love their kids to be dressed up in traditional costumes, prefer such kids sarees for festive occasions. The little ones would also look cute and adorable in such attires. Such ready-to-wear Sarees for little girls, are available in many textiles shops and online stores across India. (Pothys Textiles, The Sarees Shop, etc) This saree comes as a set with a blouse, petticoat and saree. It is also very easy to wear and remove such pre-stitched sarees. We can also prepare such kids sarees at home by modifying a normal saree or by stitching it from a good fabric. A good tailor's assistance will be needed to get the pleats stitched perfectly. When choosing the fabrics, it is always better to select a light weight material. More care should be taken if zari and sequin works are to added to Kids sarees. Wearing suitable accessories matching to the saree, can add more beauty to your little ones. Wearing a saree for a special family occasion, will surely make the childhood memorable for your little angels.